...that some assassinations have enough range to kill a second enemy who stands too close to the attacker? A food and drink dispenser. 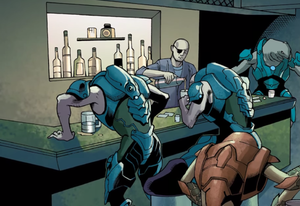 This is a list of food and drinks consumed by humans, the former client species of the Covenant, and the Forerunners. A bar in Kor Delban, Karava. A variety of human establishments are dedicated to preparing and serving food and beverages to customers. They can vary by size and specialty (foods and drinks from one or more cultures). Eddie's In The Rock - A bar that catered to miners on the Rubble. Enzo's Churrascaria - A restaurant in the city of Noctus on Andesia. Havadi Goodwan - A restaurant chain on Earth and Reach. Have S'Moa - A restaurant on Gannick 22. Jim Dandy - A franchise of restaurants present on Tribute and New Jerusalem. Leeward's - A dive bar in the city of Karnak on Draco III. The Parthenon - A bar in Sydney, Australia on Earth. Stavros' Middle East Asian Cuisine and Bar - A bar in New Tyne, Venezia. Trattoria Georgi - An Italian-style restaurant in New Tyne, Venezia. World Cuisine - A fast food restaurant chain on the planet Reach. Advertisement for a Moa burger. 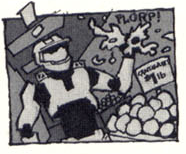 John-117 crushes a melon in this non-canon image. Alien fruit - An unspecified variety of fruit grown on human colonies, rather than their homeworld Earth, though it is often exported there. It is apparently a common topping found on pizza. Chee-Z-Snax - a type of food sold on Earth, most likely a cheese-flavored cracker of some sort. A "Ground Pounder" burger meal served at Have S'Moa on Gannick 22. 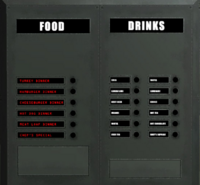 Chef's Special - Something offered by the UNSC Pillar of Autumn's food & drink dispenser. 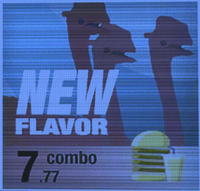 "Ground Pounder" and "Space Elevator" - two burger meals served at Have S'Moa, comprised of "100% UNSC de-radiated" moa angus patties, chicken patties, "technoartisinal" Cascade greenleaf lettuce, Sedran red fruit, "space cheddar" cheese, and Ugparassa smoked "Moebius" bacon strips served on a sesame-seed bun. Milk advertised for sale in this non-canon image. Advertisement for Gauss, a lemon-flavored carbonated soft drink. 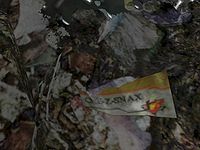 A crude "stew" aboard a Kig-Yar pirate ship. Tea - Prophets commonly prepare their own teas for medicinal purposes. Some Prophet vendors in High Charity sell certain herbs or leaves for medicinal tea to alleviate various sicknesses. Sapient species - Some of the Covenant species, specifically the Kig-Yar, Unggoy, and the Jiralhanae, are known to eat intelligent species such as Sangheili and human. Irukan - A Sangheili grain normally grown by the Kig-Yar. Colo - A meat that is farmed across Sanghelios. Uoi steak - A Kig-Yar food served with enzyme powder. Snake coils - A species of snake roasted, and then marinated to keep them flexible. They are often served by Kig-Yar clan mothers for their young, though considered vulgar. Small rodents - A species of small rodents that is prepared and threaded into a bead-like loop. Inchukoa - a chemical ingested to begin the mummification process before entry into a Cryptum. Kasna - A rare San'Shyuum alcoholic beverage. Shrop melon - A type of fruit.